I’ve been hearing about this Year of The Dog thing. What the heck is it? Do we get round-the-clock treats all year? Do we get to chase roosters? Do refrigerators get left open and unattended for a year? Waz up? Just thinking about all this makes me wag my tail. Do we get worshiped for a year? How do I prepare? What do I do? The Year of The Dog kicks off on Friday, February 16. That’s in a few days! Or now, if you’re slow at getting to this. 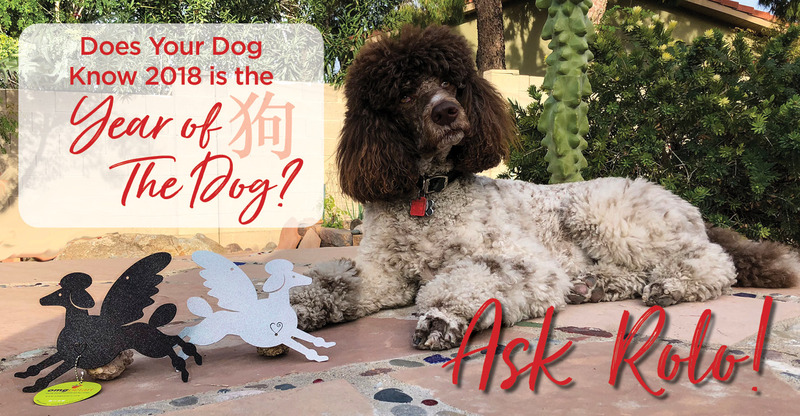 In Chinese astrology, the dog is the 11th of the zodiac animals. That’s really good, because typically volume knobs max out at 10. We start at 11. Woof! Allow your humans to worship you. As they should. Wag your tail more, stand puffy-chested and be loud and proud, cause you’re a dog! Think of this year as marking the entire territory to your heart’s content. All without even having to lift a leg. Life is good! Here’s why humans should appreciate and worship us: we’re honest, reliable partners, make for BFFs and basically LAF (loyal AF). We’re the best 4 legged friends around, ya betcha! Plus, we make better pets than roosters. Or rats. And for good luck, ask your human to get you a Pet Angel with the Chinese Year of The Dog symbol on it. It’ll look great hanging by your bed and make for a great year ahead! Also, some well-known top-dog celebrity types born in prior Year of The Dog include: Winston Churchill, JLo, Madonna, Ellen DeG, Prince William, and Socrates. I bet they were Poodle lovers too. Hell yeah! In other words, Boom…it’s gonna be a great year for us, pet lovers and especially for dog lovers. And remember, always be large and in charge!